FROM JASON’S COMPETITIVE NATURE — It’s not that I hate Andrew, or want to crush him with my gauntlet of justice, or desire to tread over the dusty remains of his bones. It’s just that when I saw his most recent post — the first in seven months — about his Lovely Games experiments with Lua and Love2D, all that nostalgia about using ClickTeam’s software came rushing back. Here’s Ugly Orbs, the sworn arch-enemy of Lovely Squares. Maybe more will come. Who knows? I have some old games sitting around that have been complete or half-complete for four or five years. Boy, those were fun. See, while Andrew’s been learning fancy-schmansy methods of “programming” and “coding” and “scripting,” I laid out some big bucks a few years back for The Games Factory and later MultiMedia Fusion. These object-oriented engines are very good at helping you slap together working applications using a WYSIWYG interface, an intuitive event editor to tell your game pieces how to act, and a graphics editor that’s fairly full-featured (I still use Photoshop for most sprite editing, though). So the game that Andrew spent 10 hours on last week took me about four with the help of the right software. And I’m a retard, barely able to navigate Linux, write HTML, or edit a config.sys file. So if I can emulate his skills, you know ClickTeam’s stuff is powerful magic. By the way, most of the sprites I used came from a Sinistar clone. They were released into the public domain by the author over at Lost Garden. 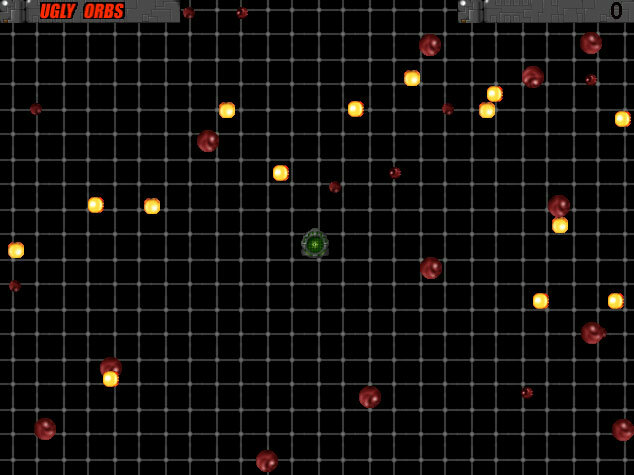 It’s very possible that (if I can rouse the energy and willpower) I might do a shooter using the same graphics. This entry was posted on Sunday, August 9th, 2009 at 12:01 am and is filed under The Vidjagames. You can follow any responses to this entry through the RSS 2.0 feed. You can skip to the end and leave a response. Pinging is currently not allowed.